Did you know that two thirds of what you learn today you will forget within 24 hours? That's what Ebbinghaus' Forgetting Curve tells us. Back in 1885, Hermann Ebbinghaus undertook a study into learning and memory, using himself as the main subject. He sought to learn a series of nonsense syllables (combinations of three letters which do not actually mean anything e.g. RIY, TPR, QUZ), and then measured how well he remembered them after different periods of time. His key discovery was that people forget information exponentially. The results became known as Ebbinghaus’ Forgetting Curve and its core findings have been repeated in many research studies since. Almost from the moment we first learn something new, we start to forget it. The decline is most rapid in the first 20 minutes, then the first hour, with 67% being forgotten within the first 24 hours. After this, the decline is less rapid although we still continue to forget, to the point that some research has shown that we forget up to 90% within a week. Whilst the precise statistics may vary between studies, the key message is always the same - people forget, and much quicker than you may think. This is quite scary. Particularly if you're investing time and money in learning and development programmes for people in your organisation. You want people to remember what they've learnt, you want people to do things differently having been on a development programme and you want your programmes to be making a difference. Fundamentally, you want a good return on your investment. The great news is that there are powerful ways to enhance learners' memory, and to make learning 'stick'. These are based on evidenced research from neuroscience, psychology and coaching and they are tools and techniques which we apply consistently, throughout the bespoke learning programmes we develop and deliver for clients. Our mission is to save the world from dull learning and to bring positive, inspiring and meaningful learning to the world. In our series of upcoming blogs, we will share with you our specialist insights and top tips for creating and facilitating learning which is memorable, developed over our many years of experience in this area. 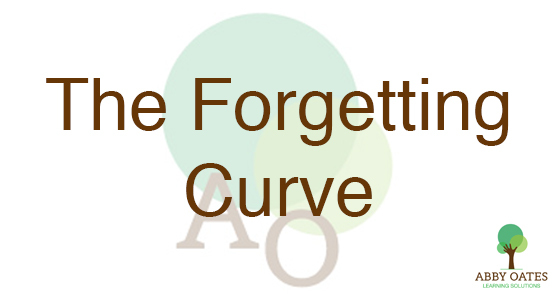 Our aim is to help you to overcome that Forgetting Curve for good! Keep a look out for Blog #2 - "Play it again Sam..."
If you'd like some advice or help to develop and deliver memorable learning for your organisation then drop us an email, we'd be happy to assist!